The Areopagus Romania Foundation, INC. exists to support ministries in post-communist and Eastern European countries to influence individual people and the culture with the Gospel of Jesus Christ. Since inception of the foundation our exclusive focus has been on partnering with the Areopagus Center in Timisoara, Romania, strategically supporting their work and ministry. Their purpose is inherently Christ centered and seeks to embrace culture from both the highest and lowest levels. They engage in ministries to key political and religious leaders as well as help disadvantaged youth and AIDS patients. They also provide a variety of programs including youth camps, forums designed for intellectual discussion, as well as theological study programs and schools. The Areopagus Center also contains one of the only and best religious libraries in the country of Romania. 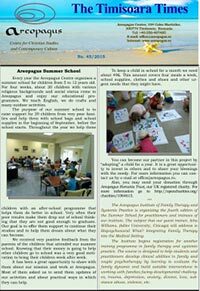 Supporting the Areopagus Center directly helps an indigenous ministry in a recently reformed and emerging post-communist country. There are key philosophical and ideological battles going on in the country of Romania and the Areopagus Romania Foundation is helping to influence the outcome of these struggles with the Gospel of Jesus Christ. Supply much needed ministry funds to the Areopagus Center . Develop and maintain a contact list / database of supporters here in the United States. Work in close conjunction with the ministry leaders in Romania to help meet physical needs. Spread the mission and vision of the Areopagus Center to various like-minded churches and individuals in the U.S. These efforts help to increase the support structure that exists in the U.S.
Work to establish good synergistic relationships with churches, schools and individuals to help organize and host speaking engagements and other various activities to specifically support and promote the ministry and activities of the Areopagus Center in Romania. These activities were initiated in December 2003. John Livingston has been a member of the Areopagus Romania Foundation’s board since its inception in 2003. John received his Bachelor of Science degrees in Business Management and Biblical Studies from Liberty University as well as an Associate of Science degree in Aviation Science from Iowa Central Community College. John has over 15 years of experience in the aviation/airline industry serving in a variety of positions ranging from instructor to airline pilot. In addition to his aviation career he has over 10 years of experience in commercial and residential real estate brokerage and management. John is an active member of Grace and Peace Presbyterian Church in Florence, Kentucky. In his free time John enjoys reading, baseball and engaging in various woodworking and home improvement projects. He resides in Walton, Kentucky with his wife Krissy and their five children. Steve Barnett has been a member of the Foundation board since 2003. Steve attended the University of Kentucky in engineering then transferd to Asbury University where he earned a Bachelor of Science in Mathematics and Computer Science. Steve taught high school mathematics and coached baseball, basketball and swimming/diving before he began his manufacturing career at General Electric Aviation. He spent 12 years at GE serving in numerous positions. In 1996 Steve began a manufacturing business that has grown to serve customers around the world in various markets, primarily aviation and aerospace. In the final years of his brief career at GE Steve and his wife, Jayne, were founding members of Grace Fellowship. Steve served as elder intermittently since it conception. Steve and Jayne have been married for 35 years this November and have 7 grown children, 7 grandchildren with an eighth on the way later this year. They live in Independence, Ky.
Todd Richmond has been a member of the Foundation board since 2003. He has a Bachelor of Science in Chemical Engineering from The Ohio State University. He worked for 13 years as a chemical engineer at Dow Corning before pursuing full time ministry in missions. Since 2010 Todd has served as the Director of Missions at Grace Fellowship Church and as the Director of Ambassadors of Grace International (AoGI) which is the missions sending ministry of Grace Fellowship. In these roles he develops and maintains relationships with various missionaries and organizations around the world and in the US. He is also responsible for developing, sending and encouraging missionaries from Grace Fellowship and overseeing the missions strategies. Todd and his wife Cindy live in Florence, KY with their three sons.